In a comment on one of the previous dvSwitch posts, see dvSwitch scripting – Part 2 – dvPortgroup, Gert asked how he could check if a portgroup with a specific VLAN Id existed on a distributed virtual switch. Since a function that allows you to search for a portgroup that meets specific requirements can be quite useful, I decided to create a new function to do just that. Additionally I will show in this post how you can change the VLAN Id of a specific portgroup. The script that accomplishes this is quite simple. This is the dvSwitch and portgroup configuration from which we start. Line 1-15: The Get-dvSwitch function was already presented in Part 2 of the dvSwitch series. Line 18-20: The Get-dvSwPg function uses for now two parameters with which it can look for a specific portgroup. These are the portgroup name and the VLAN id. The function can easily be extended to look for other properties that uniquely distinguish a portgroup. Also note that the function only takes one of the parameters, so it is either the portgroup name or the VLAN Id for now. Line 34-51: The Set-dvSwPgVLAN function configures a portgroup with the provided VLAN Id. Line 42-43: As always, it is critical to provide the “current” config version, otherwise the call to the ReconfigureDVPortgroup_Task method will fail. Line 59: A sample call to the Get-dvSwPg function. In this sample the VALN Id is used to find the portgroup. If no matching portgroup is found, the function will returm $null. Line 62: A sample call to the Set-dvSwPgVLAN function. 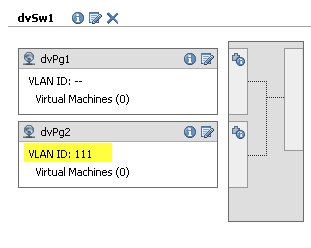 It changes the VLAN Id from 111 to 902 in this example. Feel free to post comments and questions. Ole, have a look at the updated dvSwitch scripting – Part 2 – dvPortgroup post. You can now define VLAN types ! Hi Ole, I suspect you mean the choice between “none”, “VLAN”, “VLAN Trunking” and “Private VLAN” for the VLAN type field in the vSphere Client when you create a new portgroup ? this will make my scripting a bit easier. Wil test & implement it next week because I am in the states on a vmware partner conference. Enjoy your stay at PEX. Just let me know if it works for you when you’re back.